At the end of March we will say goodbye to a comet C/2011 L4 forever. On March 10 the comet C2011 L4 approaches to the Sun as much as possible. The astronomers from astronomical observatory McDonald, the comet C/2011 L4 Panstarrs has vary long elliptic orbit. For the full passing with the orbit the comet needs approximately 100 million years. After March the comet C/2011 L4 Panstarrs will leave vicinities of the Earth and the Sun. 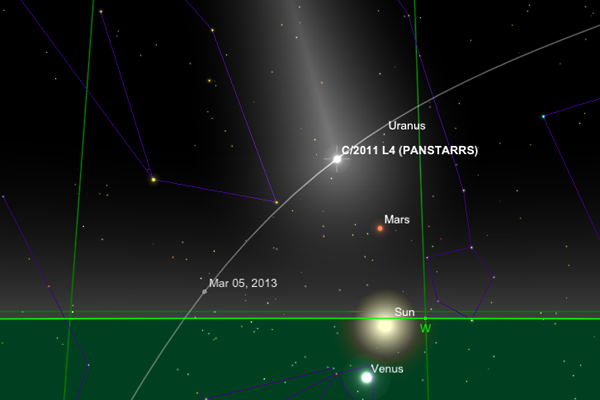 On March 10, the comet C/2011 L4 Panstarrs will fly maximally close to the Sun. The distance between the comet and the Sun will be 45 milion kilometers. As the comet is very bright, it is possible to watch it with the naked eye. On the March 5 the comet approached to our planet, and the distance between the comet and the Earth was 162 million kilometers. 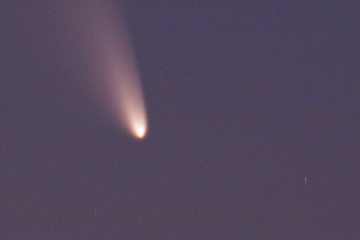 The comet C/2011 L4 PANSTARRS was opened in June 2011 by one of telescopes of Pan-STARRS system.